What Adaptations Allow Bald Eagles to Survive? 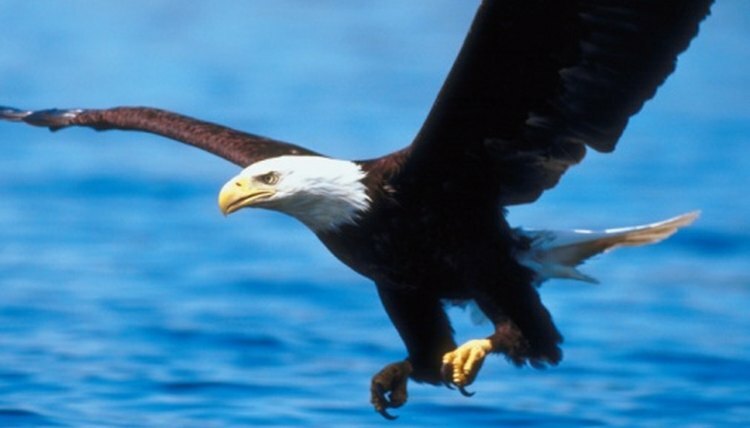 A symbol of strength and power, the bald eagle represents the United States as its national symbol. The raptor has evolved to become an ultimate predator. A powerful flyer, it sports a 7-foot-wide wingspan. Its has superior eyesight and razor-sharp, hooked talons. Its curved beak can rip through the toughest meat with ease. Its adaptations give the bird the ability to survive in the roughest outdoor conditions. Bald eagles reside near large bodies of waters such as lakes and rivers.The birds enjoy hunting fish as the staple of their diet, but they will also dine on carrion, waterfowl or small prey. The bald eagle will fly over the water until it spots fish. It swoops to right above the water, submerges its feet and grabs the fish with its strong talons. The talons curve, which allows the eagle to grasp the slippery fish and lift it from the water while still flying. The soles of its feet have raised, rough projectiles that also help hold its prey firmly in place. The eagle's impressive wingspan allows it to fly at speeds of up to 20 miles per hour. It floats across the air thermals; the vertically spiraling columns of warm air allow the bird to fly effortlessly. The bird uses virtually no energy when flying. Its hollow skeleton also helps the bird fly. Despite its impressive size, the bald eagle usually weighs less than16 lbs. when fully grown. Its wide tail works as a rudder system and allows the bird to maneuver and switch direction quickly when hunting. The strength of the bird allows it to dive toward the ground at speeds of up to 100 miles per hour. Its powerful wings allow it to quickly regain altitude once it has captured its intended target. The bald eagle boasts eyesight that is three to five times stronger than a human's sight, according to the Learning Technology Center of Vanderbilt University. The bird's large eyes and abundant cones within the retina allow it to see well at night. It can also see forward and to the side without turning its head or eyes due to an additional fovea within its eye; humans only have one fovea so they can only see forward. The bird's eyes hardly move within their sockets, but the bird compensates by being able to rotate its head 270 degrees. The bald eagle also has transparent eyelids, which helps protect their sight. The eagle does not chew its food. It uses its excessively sharp and powerful beak to tear strips of meat that it swallows whole. The bird's beak breaks through bone with ease. The bird will swallow the bones of the animal. After the food has digested and passed into the bird's system, it will eventually hack up a pellet that contains the bones and byproducts that the bird could not digest. The bald eagle lives up to 30 years in the wild. It will choose a mate for life. The pair will lay one set of one to three eggs in the spring.